The American Council of Ecumenical Churches was established by Bishop Frank Dyer (Bishop Sylvester), OA, of Santa Monica, California, during the 1940s as a project to foster the movement for Church Reunion. By 1947 it numbered ten bishops representing various communions. In 1963, Bishop Dyer consecrated Prince-Abbot Edmond II and passed to him the Council’s corporation. For some years after this, both Prince-Abbot Edmond II and his close colleague Archbishop Frederick C. King engaged in the work of collecting religious corporations in order to augment the work of the Council. 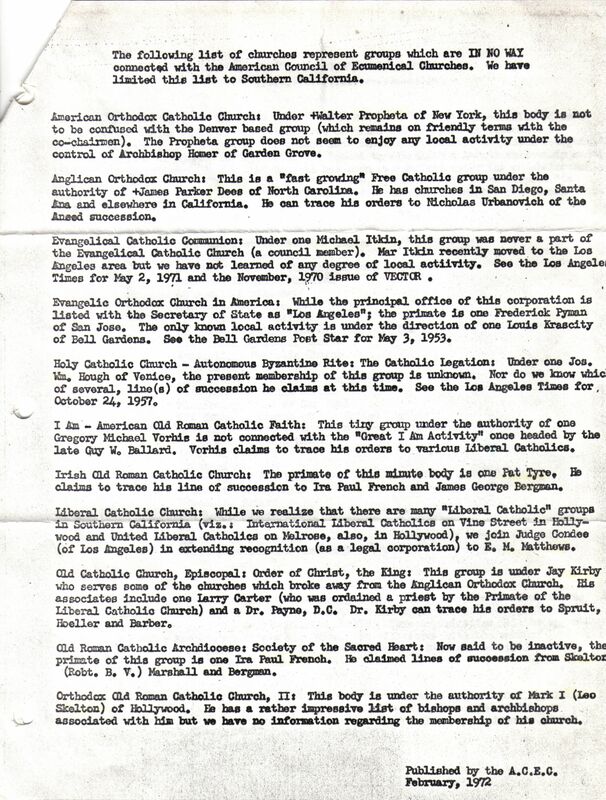 Their aim was to unify those Free Catholic bodies incorporated in California – and in Archbishop King’s case, also several in Louisiana – into a single structure under their control. As well as serving to establish legal title to the churches concerned, it also provided something of a platform for Edmond II to express his sometimes trenchant views on the shortcomings of several of his ecclesiastical peers. It should be stated that his perspectives are those of personal opinion, and should not be taken to represent the position of the Abbey-Principality on the persons and entities concerned. The Council may have begun with some degree of aspiration to growth, and in time absorbed further corporate entities in addition to those listed, but in practice there was little lay involvement other than a study group that met at Edmond II’s home. Any further plans were hampered by Edmond II’s descent into illness and the death of Archbishop King in 1985. With Edmond II’s death in 1998 the Council came to an effective end.